Shri Chandrababu Naidu has done it again. Nineteen years ago, he became Chief Minister of Andhra Pradesh and spent 9 years on the job. But he made a mess of it because he believed blindly in what the foreign management experts told him. In the process, he nearly sent the state to economic ruin. Four months ago, Naidu once more took over as Chief Minister of a truncated Andhra Pradesh. And he is taking exactly the same steps as he did 15 years ago. He has hired McKinsey as his economic advisor. They are preparing a 'vision' document to liberally develop the state. State assets and resources are being prepared to be given to private corporations. Millions of farmers may lost their land and forced to migrate. Did we say he is doing all this for the second time? A little recap may be useful. Between 1995 and 2004, when he was Chief Minister, Naidu listened and learnt less from Indians and more from western experts. He became the West's favourite Indian. Bill Clinton and Tony Blair both visited him in Hyderabad. Time magazine named him South Asian of the Year, and the British government and the World Bank chased Andhra Pradesh with grants and loans. Typically, the Indian media and elite imitated what the western governments and media portrayed, and sang the same praises. They could not think for themselves; they still don't. But the fact is that the western powers loved Naidu because he did what he was told. He was anxious to please them, and he had little idea of the reality of Indian socio-economics. In short, Mr Naidu surrendered the power that people bestowed in him. He estimated that as long as he gave the global powers what they wanted, he would receive the money and stature which count for so much in politics. So instead of devising his own Indian programme, he handed the job to the US consultancy company McKinsey. And now, in 2014, Chandrababu Naidu becomes Chief Minister again, and in the first 100 days, what are his major actions? He has hired the same McKinsey again as his economic advisor. McKinsey is again preparing the details of a similar document – this time to be called 'Vision 2029'. They are again talking about a massive sell-off of the state's resources to private corporations. Only this time, they want to do things faster, with their pet weapons cleverly named as reform, deregulation, privatizaiton, and a new one, securitization. All this is no secret. Naidu actually reintroduced McKinsey quite brazenly both in the state assembly as well as to the media, but I wonder if any journalist present reminded him of the past horror of their partnership. Naidu also announced a plethora of 'Vision 2029' projects – building cities, airports, seaports, IT parks, etc., none of which is needed by the people, but which will enrich private corporations, who will get land and assured business of over 23 lakh crore rupees (383 billion dollars).9 And how will Naidu pay for all this, since the present budget is not even self-sufficient? Through a 'securitization plan' of mortgaging state assets and by 'land pooling' through acqusition and conversion of farmlands – both to benefit private corporations. This is the beginning of the stench of the McKinsey plan. Why does Mr Naidu not suspect the shady western 'experts' is a question that remains unanswered. But he does not have to go far to know the history of people like McKinsey's - the self-incrimination is in the earlier “Vision 2020” report itself, where McKinsey put 11 glowing references to the Chile experiment of the 1980s in South America. In a coup funded by the CIA, General Pinochet took over the country and handed the economic management of the nation to a foreign group of neoliberal economists known as the Chicago Boys. They privatised social provision, tore up the laws protecting workers and the environment, and handed the economy to multinational (mostly US) companies. The result was a bonanza for big business, and a staggering increase in debt, unemployment, homelessness and malnutrition for the people of Chile. Chile's economy was destroyed, and that plan was conceived and funded by the United States government. And who funded the McKinsey document for Andhra Pradesh? Surely, Naidu may have known. 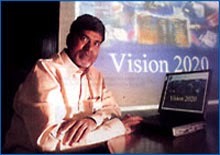 In July 2001 the British government finally admitted to their parliament that, despite numerous official denials, Britain was actually funding Vision 2020.7 Tony Blair’s government had financed Andhra Pradesh's economic misadventure and pushed for massive privatisation with the intention of enriching private British corporations. They wanted to do a Chile to Andhra Pradesh. The British government also acknowledged that it paid for and actually ran Naidu's “implementation secretariat” in Hyderabad so as to push the privatisation programme. Guess who they sent to run it - the far-right business lobby group, the Adam Smith Institute.8 The money for all this came out of Britain’s foreign aid budget. In 1995, Mr Naidu's party won the assembly elections on the promise of ridding Andhra Pradesh of the liquor mafia and to have an alcohol-free state. But his advisors – foreign 'experts' and Indian bureaucrats and economists – scared him by saying the state will go bankrupt. Imagine, they actually said that to keep hospitals and schools going, the state needs tax from sale of liquor. Naidu believed them, he withdrew his election promise, he forgot the people of Andhra Pradesh, he started speaking IT language and blindly followed the foreigners. In 2014, Naidu's party has won elections on the promise of serving the farmer and reducing his debt burden. But his 'experts' and economists are now saying this is not feasible. Naidu is already distancing himself from the farmer, he is talking the language of “smart city” and “IT hubs”; he has once again caught the tail of a foreign master. Deja Vu? Only partly. The last time, Naidu was thrown out by the people who sensed the foolishness of his western-sponsored antics. If that happens again, before he does damage to the state, then that will be deja vu. Even then, so what? The state would have lost another five years, the people would still be crying out for a humane, just, social-economic system. 1. Manufacturing is real economic activity; do not rely on service sector and finance-sector based growth. 2. Aim for thousands of small manufacturing units spread over thousands of villages; do not go for mega-industries run by a handful of corporations. 3. Please remember that Bharat was for centuries a 'udyog-pradhan desh', with a non-centralised local manufacturing which gave us the highest share of global trade, without trying to be competitive. 4. Strengthen agriculture by getting farmers out of debt permanently; not by loan waivers, but by a system of organic farming which needs no loans and gives more nutritious crops. Give the farmer better remuneration so that the rural unemployed will think of going back to farming or cottage industry rather than coming to cities. 5. Needless to say, do not build new cities. Shift the secretariat to your village. 5. Aim for 'zero fiscal deficit'. Not after ten years, start now. 6. All of the above is simple, doable, achievable, and will also be laudable and may make you chief minister a third time. Andhra Pradesh is rich not only in land, minerals, metals, etc., which is all your 'experts' can see, but it is rich in wise people who can make this alternate vison possible. If I were you, I would start with a visit to Kala Ashram, Adilabad, and meet Shri Ravindra Sharma. Best wishes..
2. Vision 2020, Page 96. 3. Vision 2020, page 42. 4. Vision 2020, page 195. 5. Vision 2020, page 170. This is worded as follows: “However, agriculture's share of employment will actually reduce, from the current 70 per cent [of the population of 76 million] to 40-45 per cent”. 6. Vision 2020, page 333. 7. Clare Short, 20th July 2001. Parliamentary answer to Alan Simpson MP. Hansard Column 475W. 8. Government of Andhra Pradesh, 2002. Strategy Paper on Public Sector Reform and Privatisation of State Owned Enterprises.